Simplify your life with our free reminder service. Let us remind you as important dates approach so you can keep your life organised. Never miss out on an occasion, forget to pay a bill or run out of milk again with free reminder alerts straight to your mobile phone. The App requires users to have a free Must Remember That account. 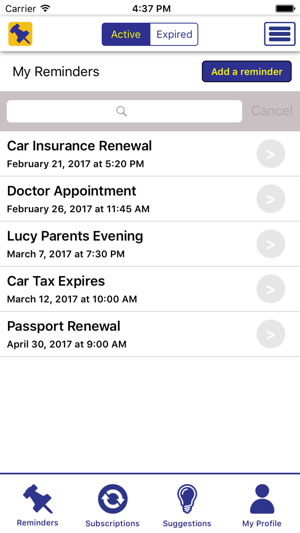 The App is used to receive push notification reminder alters direct to your mobile phone from the Must Remember That reminder service. Here are some of the popular reminders you can set with our service.